Faster healing time, less invasive, FUE mega sessions, no scaring, costs coming down, proven results. Is there any reason to now go with strip? Generally, more consistant and superior results. » coming down, proven results. » Is there any reason to now go with strip? Proven results? I have yet to see any consistent Fue mega session results. There’s probably a few ok results. There’s a lot of effort which goes into marketing these so called Fue mega sessions but I personally believe its a hit or miss. If you want consistent proven results then stick with strip. A similar thread was started on another forum so please forgive me for posting the same thing here. This is what I think we can all agree is a “very good” strip scar. I wonder how old this scar is? This is the “best” case scenario (scarwise) for a large strip procedure, IMO. 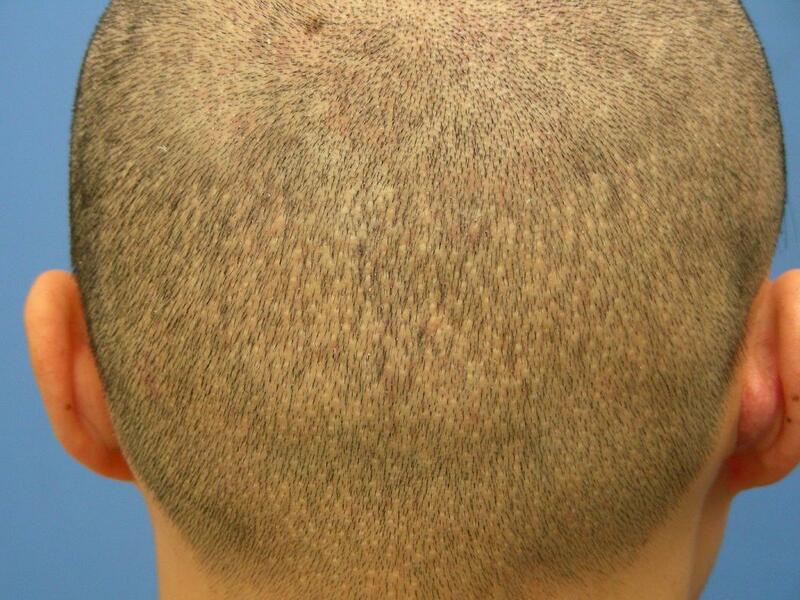 I’m sure there are varying opinions about whether or not this is acceptable in 2009 when FUE is showing some great results with minimal dot scarring. Now, if you are absolutely convinced that strip gets better yield, I suppose one could get a big strip procedure and then use beard hair (with a doc who can perform the procedure well) to camouflage the scar if needed. FUE could then be used for any touchups over the years. But if you can live with the scar (and the risk of it stretching), you may save a buck or two and maybe get better yield. However, I’ve seen some strip cases first hand and on the web that had terrible yield and wide scarring. And I’ve seen some FUE dot scarring with poor yield that wasn’t pretty either. All things considered though, having had both procedures, I’m sold on FUE with the right doc. » posting the same thing here. » This is what I think we can all agree is a “very good” strip scar. » I wonder how old this scar is? » doc who can perform the procedure well) to camouflage the scar if needed. » FUE could then be used for any touchups over the years. » save a buck or two and maybe get better yield. » poor yield that wasn’t pretty either. » with the right doc. Sofarsogood, you have made some excellent points. I would only consider FUE if I needed another HT at some point in the future. 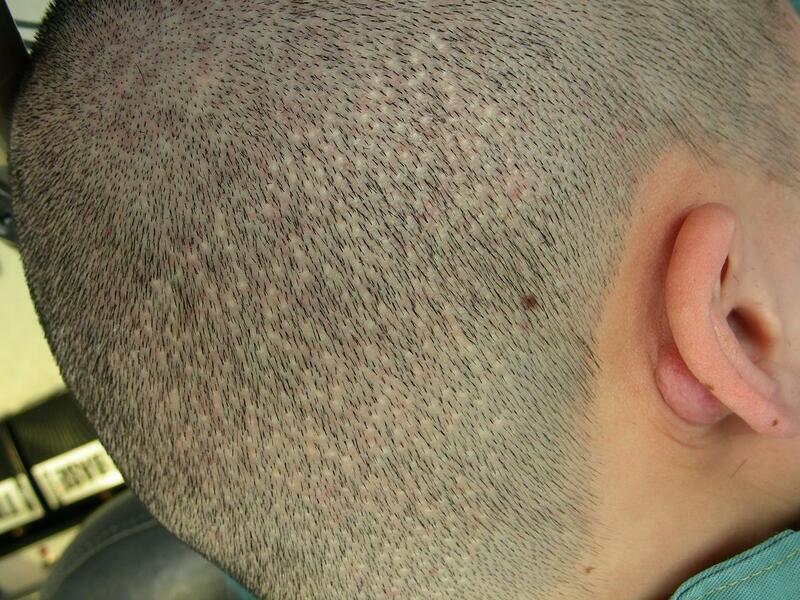 Have you seen any beard hair FUE’d into thin strip scars that look undetectable when shaved down? "Have you seen any beard hair FUE’d into thin strip scars that look undetectable when shaved down? " However, I’ve been following some beard hair donor cases on these forums for some time now. I would imagine it would be tough to get a patient whose strip scar finally isn’t visible to shave it all down to the skin to take pictures. This is the best case I’ve seen documented thoroughly on video, IMO. Looks like this patient is buzzed down to a #4 or so. 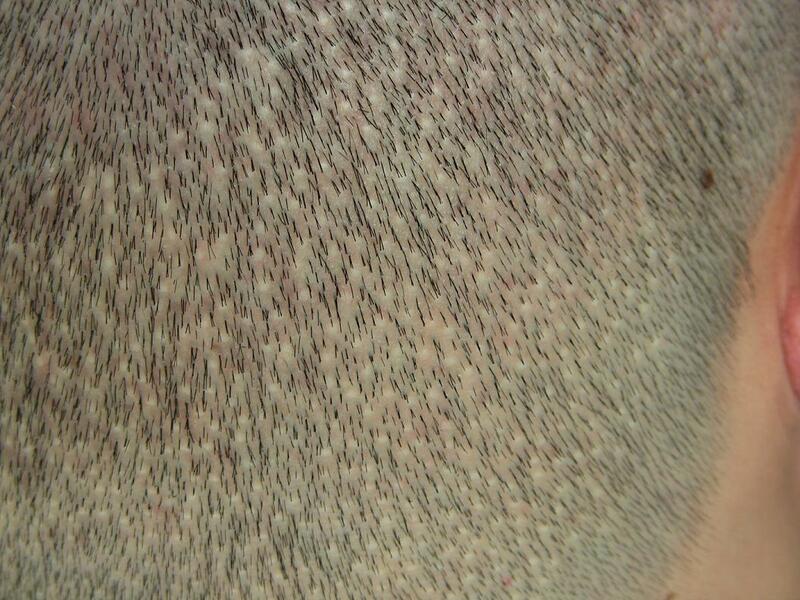 In the future, I will ask Dr. Umar to treat my strip scars using beard hair. I have TONS to spare and it’s thick as a brick. Lol. additional donor hair from beard. » undetectable when shaved down? " » for some time now. » finally isn’t visible to shave it all down to the skin to take pictures. » This is the best case I’ve seen documented thoroughly on video, IMO. » Looks like this patient is buzzed down to a #4 or so. » I have TONS to spare and it’s thick as a brick. Lol. Very nice. I would love to see what that result looks like shaved down. #2. The costs are astronomical. “It’s coming down” does not mean “It’s low” yet. The simple fact is that the cost/benefit ratio of conventional STRIP hair transplants is atrociously bad in the big picture. Let alone several thousand grafts worth of FUE from a decent doc. » Proven results? I have yet to see any consistent Fue mega session results. How many grafts do you need in order to be considered a mega session? » alone several thousand grafts worth of FUE from a decent doc. Among surgeons there is no doubt that FUE grafts are giving equal regrowth than strip grafts, provided both are performed correctly. If you find this statement to be false then I urge you to visit the next ISHRS meeting and ask all reputable docs (I have already done so). 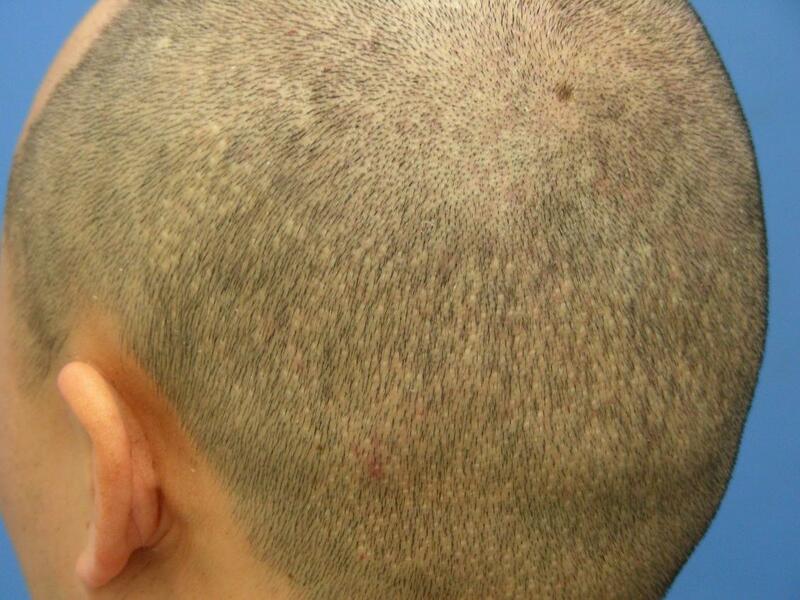 We are offering FUE megassesions at strip price level for about 1,5 years now. The reason why we can offer economic pricing model is because we can transplant up to 4000 grafts (FUE) per day (divided over 2 patients). Unlike most FUE practisionars we have a team of up to 8 assistants which enables us to perform top quality FUE work. I recall strip being more expensive 10 years ago … because at that time 1500-2000 grafts where considered large sessions. Prices have dropped because of competition and because there is no income decrease since higher volumes can be transplanted. It is a win win situation for both patient and the doc. bverotti you have to admit that in order to max out the # of grafts from the donor, strip is the way to go. I remember Bisanga’s clinic said they would only take 25% of the donor when doing fue otherwise the donor will look horrible, 25% is a very low number. Like I said, I’m not gonna start debating the graft survival rates of FUE vs strip. That’s been done on countless other threads at other times. There is a widespread opinion that FUE sessions aren’t consistently yielding the graft survival rates of strip. I’m just pointing it out. As for the price of FUE, it’s still huge in most scenarios. One clinic offering something cheap does not make it commonly cheap price in the industry. » look horrible, 25% is a very low number. We inform our patients that if we go above a certain number of extraction the donor will eventually show signs of thinning at very short hair length. There is no such thing as a free lunch ! For many patients this is not bothering since they absolutely do not to risk the linear scar that is asociated with strip surgery. As you know ANY linear scar will be more visible to the human eye at all times. Just because most of you are scared of strip does not mean that FUE is the end-all/be-all of procedures. You have surgery, and FUE is surgery, your skin will be cut and you will have a scar of some sort. Where and how these cuts occur determine how your body will react but make no mistake it WILL react. And the strip scar above posted by Sofar; I’m not convinced that it is the best that one can expected with strip. 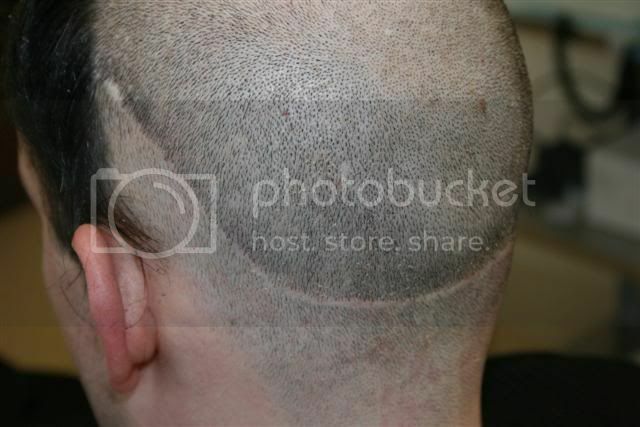 As a matter of fact, the location is completely off as the bottom most area of the removal is at the top of the nape area and not on the actual scalp where it should be. This is roughly 2000 grafts placed into the hairline. Very poor growth, maybe 25%, in the recipient. The original poster stated that FUE leaves “no scarring”. Bare in mind that I know the above representation does not represent all FUE nor is it supposed to. It does represent the same relative scenario that the the doom and gloom club say about strip though with poor growth as an added point. 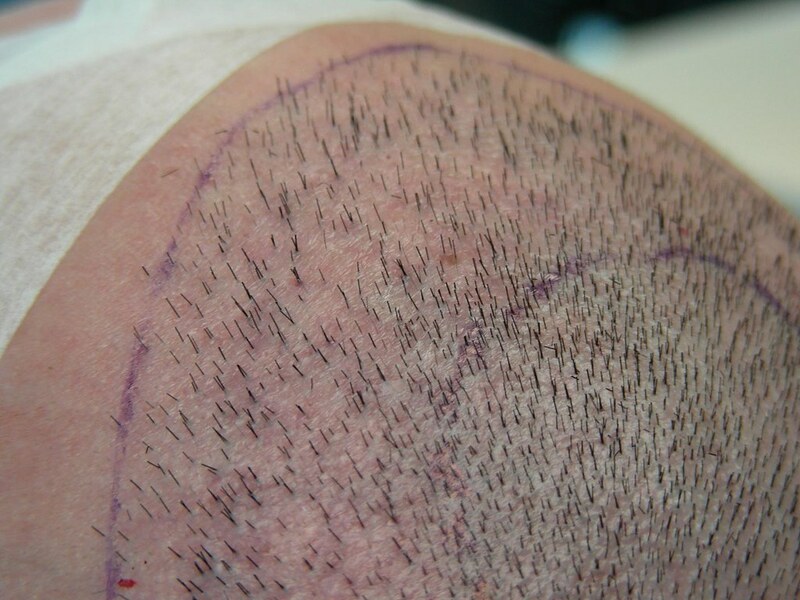 Hair transplantation is a surgical procedure no matter how you look at it. Be it strip or FUE your skin is being cut with one and only one goal in mind. To get to the good hair that you need so you can place it on top with the idea that you will be less bald and it will look natural. Period. Your main objectives should be excellent growth and naturalness. The understood trade off is that for the benefit of having more natural hair where you need it you will have, somewhere, evidence that surgery has been performed but if that evidence outweighs the benefit as shown above then the question becomes one of whether the procedure is worth undergoing in the first place. The patient above said “no” it was not. White dots still look worlds better than a strip scar, IMO. Who says Fue is totally scarless? My fue extractions in the donor never looked like anything close to this. Not then and not 6 years later. My strip scar is another story. But I still would not say all strip is bad. You clinic is top notch in that department . IMO. What I do have a problem with is strip clinics that do strip on patients under 2000 or so grafts without telling them that a Fue procedure done correctly is also a option. But that means they would have to give up some work and recomened another doc. Not saying it’s not done but hardly ever in the many patients I have talked to over the years . Example myself. There was no reason for me to get a strip. To me looking at ht’s today comapared to researching in 2001 on the internet . It’s not so much Fue vs. Strip but what clinics are doing first rate procedures no matter which technique they are offering. Strip is ancient and is becoming extinct like plugs once were. FUE is the future with unrivaled results even when compared to strip results. Don’t belive it? 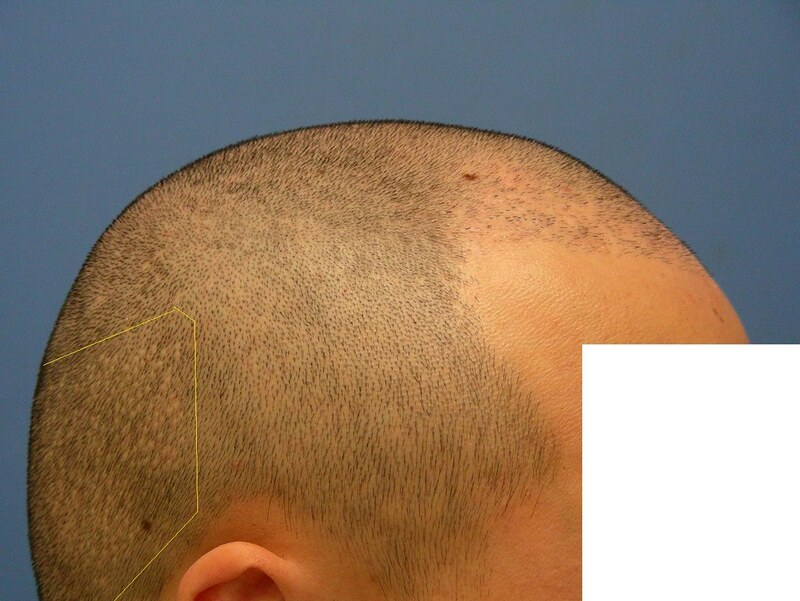 Check out Armani’s patients FUE results. » strip scar is another story. But I still would not say all strip is bad. » doing first rate procedures no matter which technique they are offering. I think the problem is that some unethical doctors market fue as scareless or they use misleading words like “virtually scareless” to cause people to think that it is totally scarless.